Lypiatt School, which supports children from service families at the Cotswold Centre just outside Corsham, is in danger of closing. I am greatly concerned that the interests of service families and the vulnerable children at Lypiatt School are not being adequately protected. The MOD needs to act quickly to secure the future of this school, and its pupils. The danger of closure is due to the announced withdrawal of funds by the MoD Education Support Fund. The school provides specialist support for military families previously posted overseas, but who through relationship breakdown or bereavement, are repatriated by the armed forces to the UK. Lypiatt Primary School is the only school in the UK providing education for repatriated service children. Due to the nature of its pupils, and the short time their families stay at the tri-service Cotswold Family Centre, the school has widely fluctuating enrolment numbers, with as many as 30 or as few as 3 pupils during the same academic year. The fluctuation of numbers is starkly shown by the example that in May 2018 there were only 10 pupils at the school, there are now 28. The Cotswold Centre is managed by the Headquarters Army Welfare Service and funded by the Headquarters Support Command: primary aged children at the Cotswold Centre are educated at Lyppiatt School, which is situated on the MOD base. The MOD Education Support Fund funding, which has underwritten the school in recent years, has now been discontinued, and Wiltshire Council are consulting on the closure of the school. The amount being withdrawn by the Ministry of Defence in the current academic year is £59,392, which will impact on the educational provisions needed for children from service families, who have particular and specialist needs. I have personally written to the Children’s Commissioner for England, asking that she should investigate the impact of this withdrawal of funds. The Children’s Commissioner’s recent report ‘Kin and Country: Growing Up as an Armed Forces Child’ has brought to public attention the particular difficulties faced by children from forces’ families. Before the ink on that report is even dry, the penny pinching of the MoD in withdrawing funds from Lypiatt School is a further damning failure of the government’s responsibility towards service families. It is hard to believe that the MoD would jeopardize the future of this brilliant school to save a measly £60000 per year. There is a social contract with the women and men in our armed forces, the military covenant, that they and their families will be supported, in exchange for the sacrifices they make. I am for the MoD to honour that obligation towards the children of service families. Closure of the school will result in these vulnerable children, often dealing with complex and difficult emotional challenges, being dissipated into mainstream schools who are not equipped to support them. In many cases the children have been exposed to parents themselves suffering from PTSD, related to military deployment. The placement of these particular children to Wiltshire is decided by the MoD, but responsibility for their education then rests with Wiltshire Council. The fluctuating admissions numbers are dictated by the MoD and the armed services, but the funding formula for local authority schools makes no allowance for such fluctuations, and therefore the school funding has been underwritten in recent years by the MoD Education Support Fund and the Armed Forces Education Trust. The fluctuating numbers of children attending the Cotswold Family Centre means that if the children are placed in other local schools, the council will still struggle to provide the appropriate level of funding for staff to support them. And this will be detrimental not only to the children housed in the Cotswold Centre, but also disruptive of other local schools. Many GMB members will be grieving today on hearing of the death yesterday of the union’s president, Mary Turner. Her health has been poor for quite a while, and had recently taken a turn for the worse, so the news was half expected, but nevertheless the huge and genuine affection that GMB activists and members hold for Mary means that it still feels like a tremendous shock. 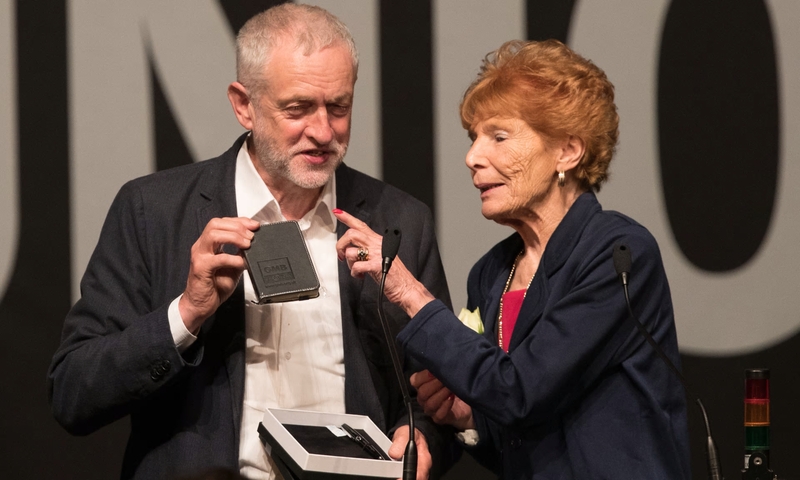 Mary was an exceptional president of GMB, and anyone who has ever been a delegate to a GMB Congress will remember her warmth and generosity in empowering the lay members of the union to shape the union’s destiny through its sovereign decision making body. She has been in the role since 1997, and expertly provided encouragement and support for delegates who need it, while providing firm and no nonsense guidance for those of us who should know better. Given the poor state of her health, Mary’s assured performance chairing the union’s 2017 Congress in Plymouth this year was remarkable, and demonstrates the strength and bravery that we all admire so much. She was also a tough and principled shop floor activist, in her own right, who had been a campaigner for free and nutritional school meals for all children long before celebrity chef, Jamie Oliver took up the issue. Indeed Mary starred in a Labour Party political broadcast on the subject in 1982. During the 1990s Mary and her colleagues fought a long battle with Brent council over school meals provision. Mary personified the best of GMB’s ethos that every worker, whether an engineer in a nuclear power plant, a cleaner in the NHS, a call centre worker or a solicitor is worthy of equal respect and dignity. Mary herself had to overcome prejudice and opposition in what had been an overwhelmingly male dominated union, though she was supported by the legendary London Regional secretary, John Cope. She built her own personal standing and authority as a formidable character and trade unionist who always had the interests of GMB and its members as her first priority. It was to no small extent her achievement that, following the 2004 turmoil over allegations of ballot rigging by former General Secretary, Kevin Curran, the union survived and emerged stronger. Mary represented all that is the best of GMB, and all that is the best of the labour movement. She will be sorely missed. Throughout the recent general election, Labour supporters in the Chippenham constituency were bombarded with advice to “vote tactically”. However, make no mistake Labour is in a better position to win here now than the Lib Dems are. The average Lib Dem vote across Wiltshire is similar to the national average, standing at just over 11% – , the Lib Dems have no realistic chance of winning a Wiltshire seat in the foreseeable future. It is Labour who are the growing challenger, both winning over voters from the Conservatives, and also attracting new and first time voters. There will always be a certain amount of tactical voting, as each voter makes their own personal decision how best to use their vote. 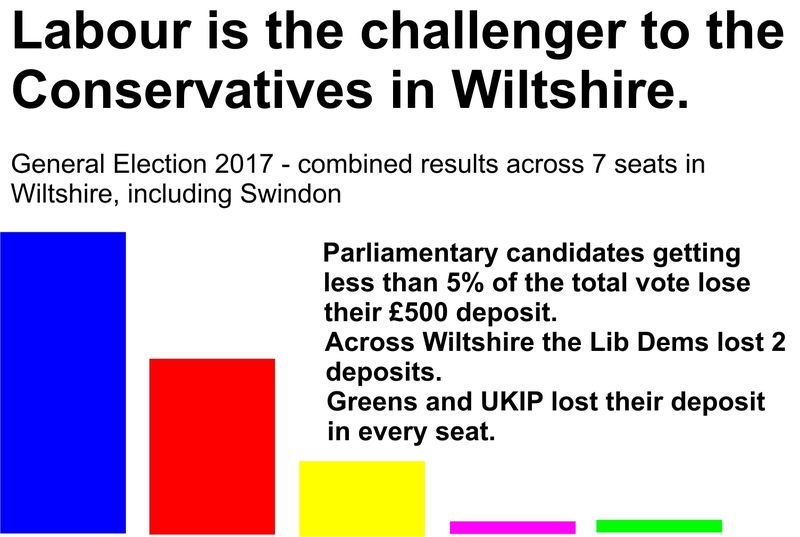 For example, the Lib Dem vote in both of the Swindon constituencies was very low, as these are tight contests between Labour and the Conservatives, and some Lib Dem voters will switch to each of these parties… seeking to influence the outcome. However, Labour supporters in the Chippenham constituency need to understand that the best “tactical vote” is to vote for what you believe in. The Lib Dems cannot win here, we have a better chance than they do. Parents, staff and pupils will rightly be concerned about six of the eight schools run by the Academy Trust of Melksham (ATOM) receiving poor OFSTED reports, and that both St George’s in Semington and the Manor will go into Special Measures. I am surprised at the complacency shown by Conservative and Lib Dem councillors quoted in the Wiltshire Times. The Lib Dem, Pat Aves, was unaware there was a problem, which shows that she doesn’t speak to parents and staff; and Conservative Phil Alford correctly mentions the dedication and professionalism of staff, but fails to address the fact that these OFSTED reports show both a failure of leadership and a system of school governance (relying on unaccountable Multi-Academy Trusts rather than on elected Local Authorities) that is deeply flawed. Even before these recent inspections, there were 3287 children being taught in Wiltshire schools rated by OFSTED as less than Good. I am a trade union branch secretary with GMB, and I regularly deal with school support staff working for ATOM. The difficulty is that schools’ management are dealing with extremely challenging financial and other practical constraints, and those run by Multi-Academy Trusts, like ATOM, are outside the supervision of the Local Authority. The current model of school governance has no local oversight of performance or financial management. Low standards are not being targeted soon enough. But we do need to look at a wider context as well. Wiltshire will see a drop of funding per pupil of £364 by 2019, due to Conservative cuts, amounting to nearly £22 million across the county. Even the best run schools will struggle to deal with cuts of that magnitude, and it undoubtedly puts an unfair strain on school managers, head teachers and school governors. Under the Conservatives, we have seen education suffer. Indeed, due to changes by the Conservative government which allow unqualified teachers, there are now 153 unqualified teachers in Wiltshire teaching 3883 pupils. That is not to doubt the professionalism and dedication of those individual staff, but Labour is committed to a fully trained, fully qualified teaching profession, supported by adequately trained and adequately remunerated Teaching Assistants. There are also 5109 primary school children in Wiltshire being taught in classes of over 30, against the guidance of educational experts that smaller classes benefit pupils of this age group. Labour will ensure a fair funding formula for schools, levelling up budget per pupil so that no school loses out. We will restore local authority supervision, and ensure that all schools are adequately funded. Labour has become the main challenger to the Conservatives in Chippenham constituency (which includes Melksham, Corsham, Bradford on Avon, and various villages). During the recent general election, Labour fought a dynamic local campaign, and successfully reached out to young voters and former non-voters. This is a fantastic base to build upon. Voters becoming disillusioned with the Conservatives are coming straight to Labour and our strong local team. The Labour result was the highest in terms of votes since 1959 and the highest in terms of vote share since 1970. The Lib Dems continue to lose support here. Labour supporters need to understand that there is no value in a so-called “tactical vote” for the Lib Dems in this constituency.